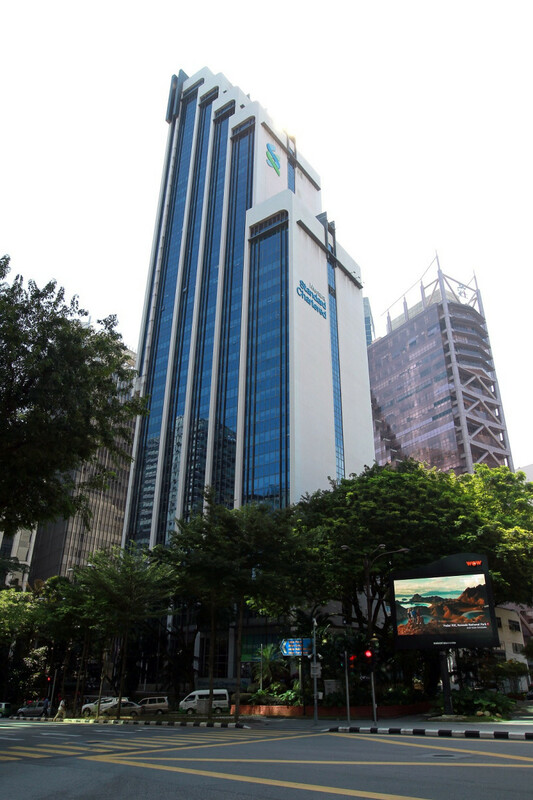 KUALA LUMPUR (Feb 12): As AIA Bhd’s anchor tenant Standard Chartered Bank (M) (StanChart) prepares to relocate its headquarters from Menara Standard Chartered (pictured) to nearby Equatorial Plaza in the third quarter (3Q) of 2019, the insurer is silent on plans for its prized office asset. “Unfortunately at this point we have no further information to share on the matter,” an AIA spokesperson said in response to questions sent by The Edge Financial Daily on its next course of action. Industry experts, meanwhile, provide a varied possibility of what AIA may do next, including the possibility of the insurer selling the office block. In September 2017, The Edge Malaysia weekly reported that AIA had placed a portfolio of 15 assets up for sale as part of its rationalisation exercise. The estimated value of its assets at that time was RM100 million. Menara StanChart building was not one of the 15 real estates. The 15 assets, located in Negeri Sembilan, Johor, Perak, Penang, Pahang, Selangor, Melaka, Kedah and Sabah, included office buildings, shop offices, condominiums and a vacant land. AIA had then said that these were non-core assets and mostly unused properties and were not central to its business needs. It is understood that AIA inherited several of the assets, including Menara StanChart, after its merger with ING Group’s insurance business in Malaysia in 2012. Sources said that AIA has managed to dispose of six or seven of the 15 assets it had put up for sale including a 10-storey office building in Bandar Sri Damansara. The 46-storey Menara StanChart has 345,628 sq ft net leasable area. It is believed that the bank occupies about a third of the building. A valuer contacted by The Edge Financial Daily places the value of the building located within the Kuala Lumpur Golden Triangle, at around RM1,100 per sq ft, or about RM380 million. Given the oversupply of office space in the city centre, it would make sense for AIA to secure new tenants before proceeding to sell it, one estate agent says. Another agent, who agrees that the insurer should secure new tenant before the sale, also points out that AIA is a long-term investor in the building and may want to hold on to this investment property. Yet another estate agent says AIA plans to refurbish the building. “The building is in a prime location. With a good refurbishment, it will do well. They are actively marketing the building for new tenants. They recently got a new serviced office in there called Compass Offices,” she adds. In 2008, Dutch insurer ING through ING Insurance Bhd bought Menara StanChart for RM328.35 million from Reco City Sdn Bhd, an affiliate of Singapore’s GIC Real Estate Pte Ltd (GIC RE). GIC RE had seven years prior, in 2001, purchased the building, which was then known as Menara Shahzan Insas, in 2001 for RM135 million. It is not known what the building will be renamed as once StanChart moves out. Meanwhile, the banking group, which has occupied Menara Standard Chartered since 2004, says that the new office in Equatorial Plaza will improve its productivity and provide better work experience for the group. Both buildings are on Jalan Sultan Ismail. “Standard Chartered Malaysia will be relocating its head office to EQ (Equatorial) Plaza after 15 years in Menara Standard Chartered. The bank will be occupying five floors of the stylish, Green Building Index-certified building located right at the heart of the Kuala Lumpur Golden Triangle. “The move will allow for greater productivity and an even better work experience with new flexible workspaces for its employees, offering greater choice and freedom throughout their working day. The move is targeted to take place in 3Q 2019,” StanChart tells The Edge Financial Daily via email. It is understood that StanChart will take up 100,000 sq ft of space in the building spreading over five floors. New York-based co-working space WeWork, scheduled to open in 1Q of 2019, is expected to take up about the same amount of space. This article first appeared in The Edge Financial Daily, on Feb 12, 2019.